With Max Chilton confirmed for a second season at Marussia today, there are just two available seats left on the grid in 2014, and they both belong to Caterham. The green team have been very coy about who may be in the frame for a race drive this season, with no hint of whether they will retain their line up from last year, or if we will see new faces at the Leafield factory in the coming months. Unlike Lotus who are planning to take their pre-season programme a little slower, Caterham have said they will be present at all three upcoming tests, with their new car revealed on the first day in Jerez. That gives them just over two weeks to announce any or all of their drivers. So, who is in the frame? As ever, there have been more drivers than race seats available this year, and with just two spots left, the names have narrowed down to those already linked with Caterham. Last year's line-up of Giedo van der Garde and Charles Pic did a solid if unspectacular job of bringing the car home whenever possible. Giedo did start to gather an unfortunate reputation for being allergic to blue flags, but when he was concentrating, he could haul some surprising pace from the underpowered machinery. Heikki Kovalainen was behind the scenes in the Caterham garage after being ousted from the race drive for the 2013 season. He made a long-awaited F1 race comeback with the Lotus team, but admitted he wasn't quite prepared for how difficult it would be, and how much rust had gathered over the twelve months he'd been out of action. Specifically, Kovalainen struggled with the tyres, given how different they were at the end of the year. The rubber is set for another revamp in 2014, however, putting everyone on the same level once more. Kamui Kobayashi has been dancing around the Ferrari team, racing for the AF Corse squad in WEC. There's not much hope of an F1 return with the Scuderia, so it's not a surprise to hear he has been linked with a potential drive at Caterham. The backmarker team have confirmed they are looking for the coveted mix of experience and youth, with a spokesperson saying: "It's flattering that a team of our size and stature is being linked with experienced drivers and I think that's more than likely to be something that we will see." Heikki and Kamui are the most experienced on the list, with Giedo and Charles racking up just a few F1 seasons between them. There's also the potential that Caterham would mix things up with a brand new face, and Alexander Rossi has been associated with them for long enough to be high up on the rookie register. The American has been a test driver for them in recent years, and has appeared in some practice sessions, but whether they would have the faith in him for a full season is questionable. Marcus Ericsson is also a name that has been firmly put in the frame, particularly as the Swedish GP2 racer has significant funding behind him. Caterham haven't been desperate for cash like some teams we've seen, but did lose out on their tenth place bonus when Marussia scooped the prize in 2013. Caterham don't have long to make their decision, but in the meantime, let's give them a helping hand. If you were in charge of the team, who would be your first choice for the 2014 season? 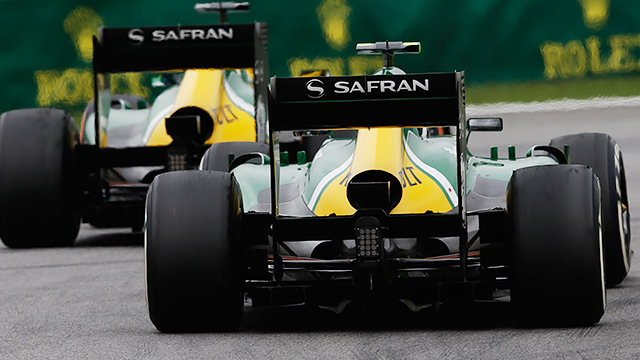 Who would you most like to see drive for Caterham this season?